Re-enactors like to use fur when possible, because there's nothing more authentic for almost any nation at any time. 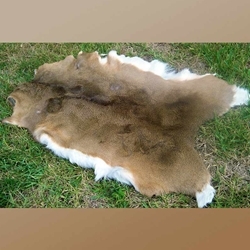 Beautiful, high quality Deer Fur is just the ticket and gives you a real sense of history. Can be worn by itself or altered for your own unique look. Not only was fur worn, but it provided a durable, comfortable ground cover as well. Note: these deer were hunted as food (just like our ancestors) and not killed for industry or sport.